Jands has just announced their latest 'flagship media and lighting control console', the Vista L5. The L5 was created in line with users in the industry, to create a stunning 21inch, Hi Definition Wacom pen table that manages the lighting rigs, which can control a number of moving lights, media servers and LED's. On the L5 display you can see the entire rig on a single screen and can access presets, palettes, effects and much more. A crisp, detailed picture shows the information in an easy to understand, clear and flexible way. 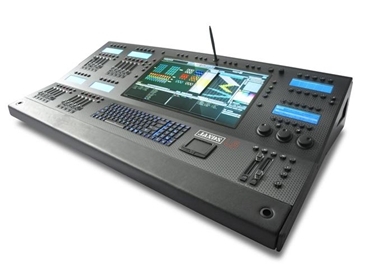 The L5 has 16 universese of DMX processed oboards with a backlit keyboard for working in dark ares, it has the capability of 25 physical playbacks each having their own LCD legend so you can split and create up to 70 playbacks per page. The Vista L5 is powered by an Intel Core i7 processer with 8GB of Dynamic RAM, contained in a rugged monocoque design that is light yet strong and sleek. “By combining the second-generation Vista software with superb design, the Vista L5 proves that powerful media and lighting control doesn’t have to be complicated – the L5 is quite simply a physical extension of the way you think," Paul Mulholland, CEO of Jands.